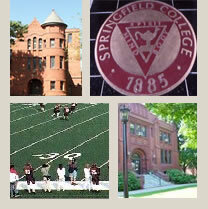 Springfield College has educated nearly 38,000 people who are at work throughout the United States and in more than sixty nations. Today, more than 5,000 students attend classes at the College’s main campus in Springfield, Massachusetts, and at campuses in Boston, Massachusetts; Los Angeles and San Diego, California; Wilmington, Delaware; Tampa, Florida; Manchester, New Hampshire; Charleston, South Carolina; Houston,Texas; St. Johnsbury, Vermont; and Milwaukee, Wisconsin. David J. Fraboni (2001), B.S. William J. Considine (1976), B.S., M.S., P.E.D. Mary D. Healey (1981), B.S., M.Ed., M.S., Ph.D.
William M. Susman (2005), B.A., M.A., P.T., Ph.D.
Gretchen A. Brockmeyer (1979), B.A., M.S., Ed.D. Betty L. Mann (1984), B.S., M.Ed., D.P.E. John W. Wilcox (1970), B.S., M.Ed. Donald J. Shaw, Jr. (1974), B.S., M.Ed. Irene Rios (1998), B.S., M.S., Ed.D.